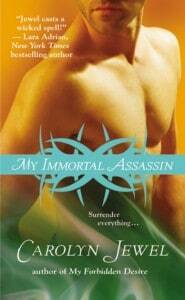 My fav type of romance, with immortals! Thanks for the chance! I have been reading reviews of this book and it sounds interesting. It should be a good book for a cold winter’s night. I am an emails subscriber of SS at the address below. I follow Carolyn Jewel on Twitter as pbearclaw. I follow SS on Facebook as Patricia Barraclough. My favorite item at the Open Sky Store is the Envicorp EnviTote. Great giveaway thank you this book sounds very good can’t wait to read it! Looks like a good win during a long blizzard! I do like the storyline!!! ThankYou for your giveaways!! I am also a GFC Follower!!! Like Carolyn Jewel on Twitter (beckerjo). Like Carolyn Jewel on Facebook.